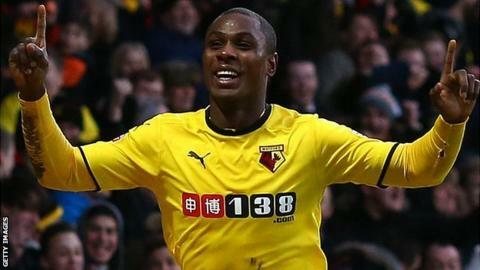 Odion Ighalo scored four of Watford's seven second-half goals to help his side fight back from 2-0 down to thrash the Championship's bottom side. Andrea Orlandi pounced to fire Blackpool's opener into the roof of the net, before Steven Davies added a second from point-blank range. Ighalo inspired the fightback, scoring either side of Troy Deeney's header. Matej Vydra struck from 20 yards before Gabriele Angella netted after Deeney hit the post and Ighalo added two more. Slavisa Jokanovic's Hornets remain sixth in the Championship table, but are now only three points adrift of the automatic promotion places. The second-half capitulation by the Tangerines leaves them winless away from home this season and nine points from safety. Watford's win against Blackpool is the first time they have scored seven goals in a game since a 7-4 win over Burnley in April 2003. Watford's win came on a day that the club celebrated the life of former manager Ken Furphy, who guided the club to the second tier of English football for the first time in their history in 1969 before going on to manage Pele at the New York Cosmos in the old North American Soccer League. The crowd at Vicarage Road paid their respects to Furphy, who died this week, with two rounds of applause, while Watford players wore black armbands in his memory. In a lively start to the game, Blackpool's Ishmael Miller dragged a shot wide and Watford's Angella headed over the bar before Orlandi punished Watford for only partially clearing the ball to score the opener. Blackpool goalkeeper Elliot Parish protected the lead under mounting pressure before half-time, keeping Ikechi Anya and Ighalo out, while Davies needed two attempts to make it 2-0 on 42 minutes after Heurelho Gomes failed to properly deal with Tony McMahon's effort across goal. Ighalo sparked the astonishing second-half fightback with a tap-in finish just after the break and then fired Watford ahead from a tight angle after Deeney levelled with a header from Daniel Tozser's corner. Vydra beat Parish with a fine strike, while Gomes tipped a Jamie O'Hara free-kick over the bar at the other end before Angella reacted quickest to slot home a fifth after Deeney hit the post with a header. Ighalo completed his hat-trick with a simple finish, latching on to a loose ball after Deeney again hit the woodwork, and the Nigerian was assisted once more by his strike partner for his fourth of the afternoon. Match ends, Watford 7, Blackpool 2. Second Half ends, Watford 7, Blackpool 2. Ishmael Miller (Blackpool) wins a free kick on the right wing. Attempt blocked. Jamie O'Hara (Blackpool) left footed shot from outside the box is blocked. Assisted by Niall Maher. Attempt missed. Troy Deeney (Watford) right footed shot from outside the box is high and wide to the right. Assisted by Matej Vydra. Goal! Watford 7, Blackpool 2. Odion Ighalo (Watford) right footed shot from very close range to the centre of the goal. Assisted by Troy Deeney with a cross. Attempt blocked. Juan Carlos Paredes (Watford) right footed shot from outside the box is blocked. Assisted by Miguel Layún. Attempt blocked. Miguel Layún (Watford) left footed shot from outside the box is blocked. Assisted by Matej Vydra. Substitution, Watford. Gianni Munari replaces Daniel Tözsér. Attempt missed. Daniel Tözsér (Watford) left footed shot from outside the box is high and wide to the left. Assisted by Miguel Layún. Offside, Watford. Juan Carlos Paredes tries a through ball, but Miguel Layún is caught offside. Goal! Watford 6, Blackpool 2. Odion Ighalo (Watford) header from very close range to the centre of the goal. Troy Deeney (Watford) hits the right post with a right footed shot from the centre of the box. Assisted by Matej Vydra. Attempt saved. Odion Ighalo (Watford) left footed shot from the centre of the box is saved in the centre of the goal. Assisted by Matej Vydra with a headed pass. Attempt missed. Ishmael Miller (Blackpool) left footed shot from outside the box misses to the left. Assisted by Jamie O'Hara. Offside, Watford. Ikechi Anya tries a through ball, but Matej Vydra is caught offside. Goal! Watford 5, Blackpool 2. Gabriele Angella (Watford) left footed shot from very close range to the high centre of the goal following a corner. Gabriele Angella (Watford) hits the right post with a header from the centre of the box. Assisted by Miguel Layún with a cross following a corner. Corner, Watford. Conceded by Nyron Nosworthy. Corner, Watford. Conceded by Darren O'Dea. Corner, Watford. Conceded by Tony McMahon. Corner, Blackpool. Conceded by Heurelho Gomes. Attempt saved. Jamie O'Hara (Blackpool) left footed shot from outside the box is saved in the top left corner. Goal! Watford 4, Blackpool 2. Matej Vydra (Watford) right footed shot from the centre of the box to the bottom left corner. Substitution, Blackpool. Niall Maher replaces Peter Clarke because of an injury. Delay in match Peter Clarke (Blackpool) because of an injury.